Ridgewood’s lack of a hockey program does not stop our students from shredding up the ice. Ridgewood has four students on the Leyden Eagles Club team that is currently ranked 5th in the Illinois Central Division. The Leyden Eagles Club team is composed primarily of underclassmen and is one of the youngest teams in their league. On top of being a young team, there are only 22 players on their Varsity team and there is no JV team. They have been competing against much bigger programs with multiple Varsity and JV teams. This however has not stopped them from being a top contender in their division. The team is a combined team with athletes from Elmwood Park, East Leyden, West Leyden and Ridgewood. 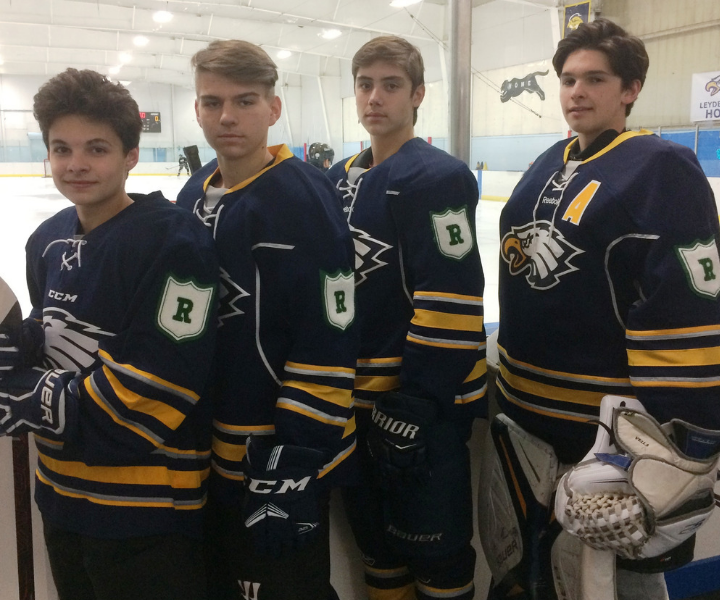 There are four Ridgewood students on the Leyden Eagles hockey club team. To show their home school pride, each of the players jerseys have patches with their home school logo. This year from Ridgewood there is one freshman, Ryan Johnson and three sophomores, Jacob Miskowiec, Eric Kubacki and Adam Johnson. Adam Johnson spoke about the comradery among the players that form the Eagles. The Eagles are gearing up to make school history again this year. During the 2017-2018 season, they made it to the Elite 8 and the team that defeated them went on to win the state title. This was the furthest the Eagles had ever gone in school history. The Eagles had three players chosen to play in the All-star game on Saturday, January 5, 2019. Adam Johnson, who is the goalie, was one of the athletes who earned a spot on the all-star team. Are you interested in playing hockey next season? Contact one of the players mentioned above or stop by the Athletic Department in room 225b.